Vega is a gift of love to me from my son Jeremy. Vega was only 7 weeks when Jeremy gave him to me Easter of this year. He is a loving, loyal affectionate pit. Loves undivided attention. I take Vega on trails all over, Pepperell, Groton, Billerica, Chelmsford, Worlds End, Myles Standish Forest on and on we go. good with my grand kids. Oh yeah, I am 72 years young and Vega will keep me young. He does so many wonderful things and I really can't type it all here. pit bulls. 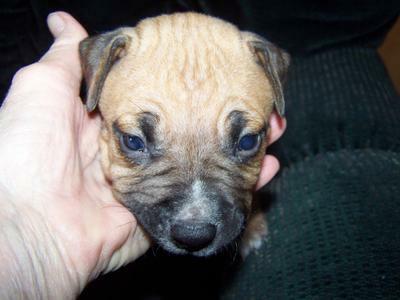 Two were Stafforshire Terriers. They are all unique and never harmed anyone or anything. In my home we always had a cat or two. And the last 18 years have always had grand kids around. My feeling is that they are who you are and if you love they love too. You are so right on the statement that the dog is love if given love. My half staff/husky dog is the most loving dog i've ever had. He loves everyone on first meeting, and enjoys HIS cat and mine as well. My Freckles is the first dog to be allowed on the furniture because he doesn't smell bad. He loves to walk no matter the weather conditions. I hope your pooch continues to keep you young and in fit condition. Thanks for sharing your wonderful experiences. I love to read articles like yours. Vega! Wonderful people with their awesome pets. to reinforce the great nature of pits.